The Memorial Art Gallery’s “Hidden Passions: Inspiring Conversations about Hyphenated Lives” is in its third season of celebrating the creative lives and private hobbies of Rochesterians. “Hidden Passions puts our friends and neighbors center-stage so that we can marvel at the extraordinary creative adventures happening all around us … and perhaps find inspiration for our own,” says Jonathan Binstock, the Mary W. and Donald R. Clark Director of the Memorial Art Gallery. Here, we highlight two members of the University community who are being featured this season. Omar Soufan and Ibrahim Mohammad are two of four featured speakers at Memorial Art Gallery’s Hidden Passions event at 7 p.m. Thursday, February 9. They will be joined by fellow undergraduates Dan Hargrove and Erik Rosenkranz, who will share the stories of their passions. Omar Soufan ’17 and Ibrahim Mohammad ’17 knew from the minute they met three years ago that they were bonded by their pasts—and their future. Soufan left war-torn Syria for the United States five years ago. Mohammad is a Palestinian refugee who lived in Lebanon before coming to America. In 2015, they set up a physical rehabilitation center in Lebanon, on the Syrian border, to help Syrian refugees wounded in that country’s ongoing civil war. Now, they’re working on the second phase of their project, Prosthesis for a New Syria, which aims to bring 3D-printed prosthetic upper limbs to refugees at the rehabilitation center. 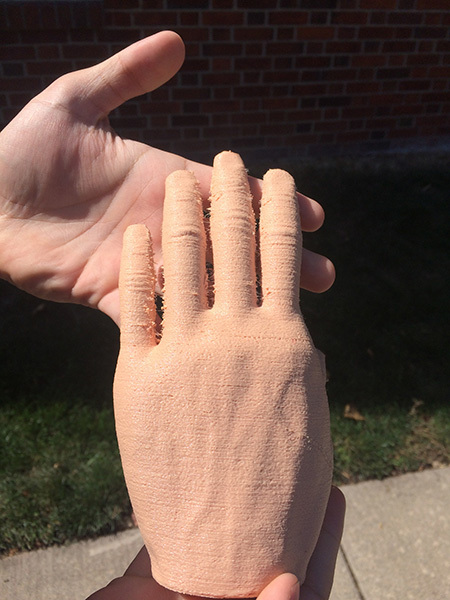 “We want to give amputees prosthesis that are affordable, cosmetically appealing, and functional,” says Soufan, a biomedical engineering major. Soufan was born in Chicago in 1994 when his mother was visiting her brother, a Syrian-born anesthesiologist. His entire family is from Syria, and that’s where he grew up. His younger brother is a freshman at a college in Minnesota, and his sister is in ninth grade back home. Omar Soufan, left, and Ibrahim Mohammad. (University photo / Keith Bullis). 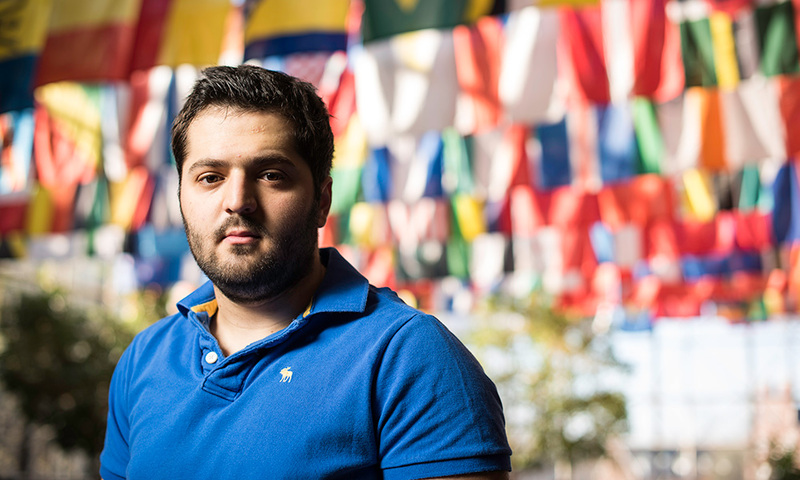 Soufan enrolled at the College of DuPage, outside of Chicago, in 2012, and transferred to Rochester two years later. During a trip home, he passed through Lebanon. Walking through Beirut, he was stunned to see refugees sleeping on the ground. Soufan and Mohammad, a mechanical engineering major, settled on the idea of a medical facility to help refugees after finding an existing building near the Syrian border. They applied for a Davis Projects for Peace grant, which offers $10,000 to support grassroots projects that promote peace and address the root causes of conflicts. After coming in second place, they set up a Facebook page, eventually raising around $7,000. Those interested in donating can visit the Facebook page here. They received additional sponsorship from the Syrian American Medical Society and the Qatar Red Crescent Society, an organization in Qatar similar to the American Red Cross. The result was a two-story facility that includes six hospital beds and a dozen staffers—doctors, nurses and administrative help—and treats more than 100 patients per month. 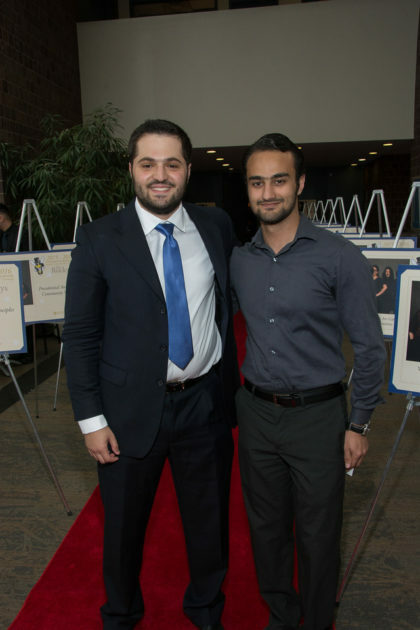 Soufan and Mohammad were honored with the University’s Social Entrepreneurship Award at the annual Student Life Awards (the “Rockys”) last April. To launch the second phase of their project–Prosthesis for a New Syria–they connected with Adam Arabian, an associate professor of mechanical engineering at Seattle Pacific University who specializes in the research and design of low-cost prosthetics. Arabian introduced them to e-NABLE, a global network of volunteers who use 3D printing to create free hands and arms for those in need. Father Brian Cool, director of the University’s Catholic Newman Community, knows both students well. He met Mohammad when they both made service trips to the Dominican Republic—Mohammad for a water project with Engineers Without Borders, and Cool to dig latrines. Cool met Soufan in 2015 when Soufan called him to ask for advice and assistance with the rehabilitation center project. Omar Soufan ’17 and Ibrahim Mohammad ’17 are part of a University team competing for the Hult Prize. The largest social entrepreneurship competition in the world, the Hult Prize is sponsored jointly by the Hult International Business School and the Clinton Global Initiative. More than 10,000 students from 150 universities around the world will take part. In March, the team travels to San Francisco for a regional competition for the prize. Winners of the regional finals advance to the international finals in September, with a chance to win the $1 million first prize, plus mentorship from the Hult Business School and the international business community. Joining Soufan and Mohammad on Team Meliora are Edgar Alaniz ’17, a biochemistry major from Rio Bravo, Mexico; Carlos “Yuki” Gonzalez Roman ’17, a financial economics major from Asuncion, Paraguay; and Min A ’18, an engineering and business double major from Nei Mongol, China. The team hopes to form a company that provides sustainable housing, built from recycled plastics, for refugees. The technology was created by the Colombian company Conceptos Plásticos, and already has been used in that country. Team Meliora hopes to take the technology to Egypt, Lebanon, Morocco, Palestine, Syria, and Turkey.